Triple-threat Paula Poundstone, an American stand-up comedian, author and actress, will be performing Feb. 13 at the Peoples Bank Theatre. The Peoples Bank Theatre crowd can expect this as well as witty banter about the comedian’s life, she said in a phone interview this week. “I talk about raising a house full of kids and animals and trying to pay attention to the news enough to cast a halfway decent vote,” said Poundstone of her set, which she deemed appropriate for most age groups. Peoples Bank Theatre is hosting Poundstone from 8 to 9:30 p.m. the night before Valentine’s Day, with ticket prices available now for purchase, either online through the Peoples Bank Theatre website or at the box office located at 222 Putnam St. Single ticket prices range from $20 to $30. “Ticket sales have been brisk… so far this season it has been one of our best sellers,” said Drew Tanner, marketing director for the theater. Poundstone, who has had a 35-plus-year career in the entertainment industry, has worked alongside other hilarious women like Joan Rivers and Caroline Rhea. In the ’90s, she was a correspondent on The Tonight Show and The Rosie O’Donnell Show and appeared on Hollywood Squares, among other TV appearances. Comedian Paula Poundstone is set to perform Feb. 13 at Peoples Bank Theatre. The acclaimed comic will entertain from 8 to 9:30 p.m.
Tickets are available now at the box office or online at the Peoples Bank Theatre website. Ticket prices range from $20 to $30. Peoples Bank Theatre is located at 222 Putnam St. in Marietta. She has also had a slew of one-hour HBO comedy specials. 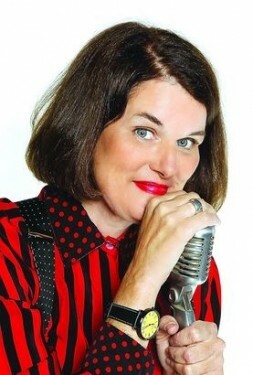 Named one of Comedy Central’s “Top 100 Greatest Standups of All Time,” Poundstone has most recently done voice over work for the animated film “Inside Out.” She presently partakes in NPR’s “Wait Wait… Don’t Tell Me,” an international weekly news quiz show that has a huge following and has won both a Peabody Award and Webby Award for humor. The comedian likens her stand-up set to her highly-improvised commentator role on the NPR podcast. Poundstone added that her jokes are written organically, often inspired by doing her mundane, motherly duties. “I have a very common life. I try to take care of my kids, pay the bills, put recycling in the right bin on the right day. My desk is full of little pieces of paper with ideas scratched on them. Now if only I could remember why I found those words funny in the first place like ‘latex gloves,'” she said. Renowned yet relatable, this funny lady will be one act not to miss when she makes a one-night only stop in Marietta as part of her ongoing tour. With aerial acrobatics, contortion, juggling and magic, “Cirque-tacular’s World: European Edition” rang in a new era of professional performance and entertainment in Marietta Friday. As the opening show of the newly resurrected Peoples Bank Theatre on Putnam Street welcomed more than 900 new patrons, local magician Steve Dixon, 57, of Marietta, captured exclamations with card tricks and slights of hand as people waited to be seated. (JANELLE PATTERSON The Marietta Times) Eric Walton, 45, of New York City, magically pulls a rope through his body with the help of Adele McCombs, 6, of Marietta, Friday during the inaugural performance at the Peoples Bank Theatre. 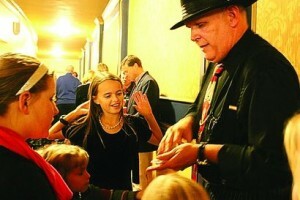 (JANELLE PATTERSON The Marietta Times) Lillian Floyd, 10, of Vienna, watches in awe as Steve Dixon, 57, of Marietta, performs card tricks in the walkway behind the first floor seating. That awe was merely a precursor to the main event, one for which families, couples and friends all made their way to the theater. 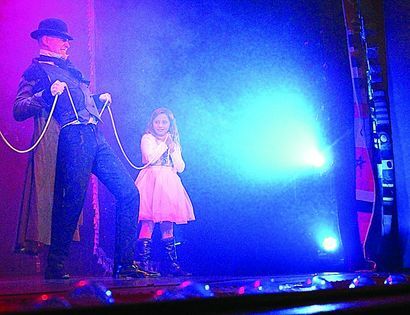 Adele McCombs, 6, of Marietta, said her favorite part of the night was when she was pulled onto the stage by the writer, emcee and magician of Cirque-tacular, Eric Walton, 45, of New York City, for a special trick. Walton said he hoped the audience walked away not only amazed and enthralled but also having learned a smidgen of the historic influences of European cultures to the art of circus performance. “It’s a global idea that we had to really showcase the heritages and cultures of the world through circus and pay tribute or homage to their contributions,” said Walton. Also the emcee and a magician in the show, Walton introduced each act with a glance into the European influence. One other local resident to make his debut that night was Jerry Brock, 77, of Marietta. “It’s fun,” he said following his part in a magic trick where Walton guessed the location and face of a coin in the hands of five participants. Brock said the most intriguing piece of the night though was when Jared Rydelek, 30, of New York City, contorted his body into impossible positions. “I thought it was unbelievable,” he said as he laughed. Owner of the company and lead acrobat in the show, Tad Emptage, 39, of New York City, spoke before the show about how each piece was conceptualized. Emptage and Walton said they both felt honored to be the first to perform on a stage that has been vacant for 30 years. The pair were joined by fellow performers all living in New York City; Aaron Bonventre, 42, Jared Rydelek, 30, Ellie Steingraeber, 31, and Kelsey Strauch, 33. Drew Tanner, marketing director for the theater, said having the circus performance on the new stage allowed the theater to showcase all it has to offer both performers and patrons.